Paul McCartney John Lennon. In this hall on 6th July 1957 John & Paul first met. The Quarry Men featuring, Eric Griffiths, Colin Hanton, Rod Davies, John Lennon, Pete Shotton and Len Garry performed on the afternoon of 6th July 1957 at St Peters Church Fete. 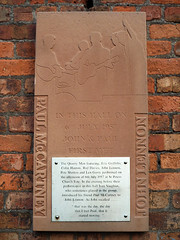 In the evening before their performance in this hall Ivan Vaughan, who sometimes played in the group, introduced his friend Paul McCartney to John Lennon. As John recalled ...... "that was the day, the day that I met Paul, that it started moving."